By Matt Trentham, Scott Johnson and Ward Deters, members in a band with Rachel called The Porch Possums. Entire contents copyright © 2014 by Matt Trentham, Scott Johnson & Ward Deters. All rights reserved. On Christmas morning of 2014, with the sudden passing of Rachel E. Blanton, our community lost an amazing young woman at the peak of her career. 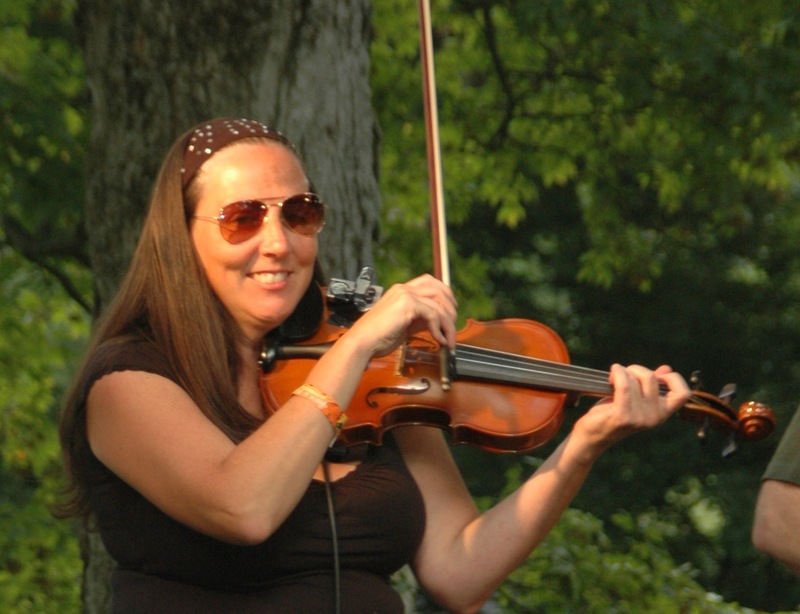 A brilliant musician with a startling array of meaningful relationships within all aspects of the Louisville artistic community, she taught at Sacred Heart Academy for 15 years, developed the music program at Montessori School of Louisville, and played a crucial role in the formation of Abbey Road on the River. We were looking to expand our start-up band about the time that Ward and Rachel’s paths crossed at a jam session held at a mutual friend’s house. Without knowing exactly what she was getting into, she accepted Ward’s invitation to come out for dinner and to play music. The first night went very well musically and she seemed like such a nice person, so we began our musical adventure and friendship. The four of us enjoyed joking and talking and working on songs together. She was a natural fit with the bluegrass-ish, folk rock, old time country sound we were becoming. We assumed her skills came from recent work with two Irish bands and a semi-rock band. It took us a while to learn she had a Bachelor’s and Master’s Degree in Music from the University of Louisville. It took more coaxing to learn she was a founding member of a period instrument ensemble called Bourbon Baroque. Now her amazing musical skills and adaptability were starting to make sense. Our first gig was at The Bard’s Town. We were so excited to play a real gig, in a real bar on Bardstown Road. She shared that enthusiasm with us without letting on that she had taken the stage before so many times she probably lost count. In trying to build the audience, she said, “I invited everyone on my Facebook friends list. I think we’ll be in trouble if everyone comes.” I asked her, “How many Facebook friends do you have?” She said, “I don’t know, almost two thousand I guess.” Who has two thousand Facebook friends? Is she collecting names out of the phonebook? Over the next three years, we learned she has that many Facebook friends because… she has that many friends. Rachel Blanton had friendships that crossed musical lines and stretched far beyond Louisville and Southern Indiana. She would say things like, “Why don’t you come down to Abbey Road on the River this weekend. I’m playing in a band.” And we would show up to see our friend Rachel rocking the violin on center stage playing our favorite Beatles songs with multiple bands, and then later in an event called All You Need is Love. She taught countless students, played in multiple weddings and church services and assisted other musicians with recording projects. Her small paper calendar was filled with handwritten notes and events. I am inspired to learn and experience the impact a mild mannered violin player can have on an entire community. It is heartwarming. I think Rachel probably underestimated her position in other people’s lives and our community. She certainly never mentioned or discussed it. She truly was a modest person who played for the love of music, collaboration, friendship and the common experience that is felt when the song goes well. I think she was also deeply motivated to teach and share her passion with students of all ages and skill sets. She had the ability to balance between participating in the music, enjoying the experience of it and guiding others through it, all while not being the apparent leader. She connected many people through her music collaboration and kindness. Ward, Scott, Matt and Rachel. In that picture, we are doing “Salvation Song” by the Avett Brothers. In a verse, we sing, “If you take of my soul, you can still leave it whole, with the pieces of your own you leave behind.” Then we all sing the chorus: “We came for salvation, we came for family, we came for all that’s good, that’s how we’ll walk away. We came to break the bad, we came to cheer the sad, we came to leave behind the world a better place.” It’s as if she wrote those lyrics herself. 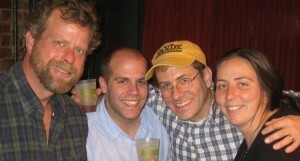 Our bandmate Ward Deters was the last one of us to talk with her the evening of December 23rd. Ward said she was looking forward to the New Year and all the musical projects on her list of things to do. She was going to have a very busy year. We all traded texts that day. One of her last texts to us was, “I love you all”. We know we were not in a small, exclusive group. Rachel loved many people and was loved by many people. She leaves behind an uncomfortable pause in the song, and an empty feeling in our souls. I feel certain she would not be pleased with the long pause and would insist on us all picking up our instruments and working diligently on the next project or gig. We will, in time.